Section 3 champ Mason Bush placed 5th in the state last year at this weight and was a ESC finalist this year making him one of the favorites here. Bush is 49-2 this season but one of his losses was to S3 wildcard Devin Coleman at the S3 Class B tournament; a loss that he would avenge in the S3 finals. Bush has 6 wins over wrestlers in the field! 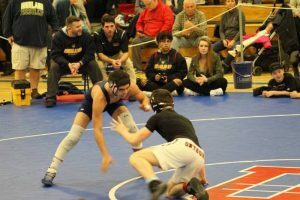 Caleb Svingala is a perfect 40-0 this season and will definitely be one of the wrestlers challenging Bush for the title. Dante Geislinger from S4 has a few very close losses to Bush this season and will definitely contend as will S9 champ Nikko Walsh. Merwin (S4) has a win over Walsh and will make noise here as will Schubert and Schafer, both from S5. All signs point towards a showdown of last year’s D2 state title match between S5 champ Noto and S11 champ Titus. Last year Noto won the state title with an OT pin but Titus exacted revenge in the semis of this year’s Eastern States Classic winning 5-1 in sudden victory. There is plenty of talent here though and we can expect to see a few other guys contend for the top step on the podium. Baer (S10) and Balducci (S1) both placed at this tournament last year and we definetely have to keep our eyes on Micah Roes who only has 1 loss this season and it was to 113 S3 D2 champ Marek Bush. Mike Evans from S6 could be a sleeper here as well! This is going to be an awesome weight to follow with 5 former state place winners all vying for the title! Marek Bush (S3), John Worthing (S4), Drew Schafer (S5), Joe Costrastano (S8), and Matt Garland (S3) have all placed in Albany! S7 champ Seymour only has 2 losses – both at ESC and one was a 4-2 loss to D1 S11 champ Sean Carter. Throw in Merwin (S4) and Alshawi (S6) and this becomes a very deep weight. One of the more intriguing wrestlers here may be S9 champ Eric Tigue who notched a 5-3 win over 2016 state champ Jon Charles. The Section 2 champion Trent Svingala is a returning state champ and has a perfect 38-0 record this year making him a definite favorite to take home title number two! Svingala has scored bonus points in nearly every match this season however one wrestler had kept him to a regular decision twice, wildcard entry Aidan Cullen (S2). In his title run last year Svingala’s closest match was to Brad Cheek from S5 who is also in this year’s bracket and hopes to reverse the outcome of the 4-2 sudden victory loss he suffered in Albany last year. 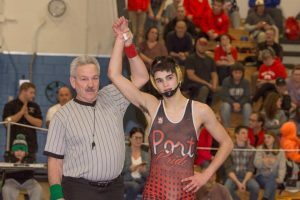 We also need to watch for last year’s 113 pound state finalist Caleb Robinson from Section 4 as well as Keith Cassar from S8 who finished 4th at 113 last year. S9 champ Palanca has made great strides this year and could end up making a run for the medal stand! Defending state champion Orion Anderson from Section 2 is perhaps the biggest favorite to win his weight in the entire D2 tournament! 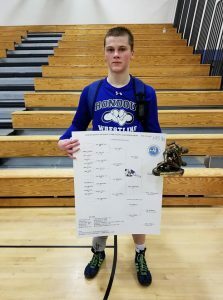 His only loss this year was in the finals of the Eastern States Classic for Beau Bartlett from Wyoming Seminary – the 4th ranked 126 pounder in the nation according to FloWrestling! Others contending at 126 will be Matt Campo (S11) and Mikey Squires (S4) – both state place winners last year. S5 champ Schuster has only lost once this yearand will be in the mix as will Miceli from S11 and S5 wildcard Ferro! And do not sleep on Bradell from S6 … he has an impressive 35-3 record and has posted some great wins this season! There are 5 returning state placewinners in this bracket! Luke Bokina from S11 and Hector Colom from S6 were both state finalists last year however they both have losses this year to S3 champion Cahal Donovan who placed 4th in NYS last year. 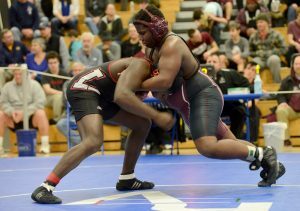 Donovan came in 3rd at ESC this year and also has a win over S5 champ Young who was a state placer last season. S1 champ Sams placed 6th in NYS last year and we definitely need to watch S6 wildcard Evans who has a win this year over Colom! S8 champ Costa should definitely not be overlooked. He has only 3 losses on the season including a tough 3-2 decision to Bokina at the ESC. 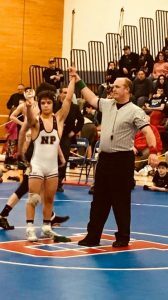 Section 4 champ Bivar is a returning state place winner and he’s having a great year. His only loss on the season has been at 152 pounds to defending state champ Hunter Shaut. One of his closest matches all year was a 3-2 win over S11 champ Zarif. Section 3 has two strong entries in McKenna and Gerber. McKenna has two losses on the season, both were at the Eastern States Classic and one was a 5-4 decision to ESC champ Chris Gomez. Gerber has lost 4 times to McKenna this year but each time it’s been by 2 points or fewer. Section 5 has two strong entries in Runfola and Gray and so does S1 in Wrobel in Bruno. S6 champ Putney is 42-2 with one loss coming to a kid from Sem and the other to D1 entry DeWolff. 145 will be awesome to follow – we have a state champion, state finalist, and a state 3rd in this bracket! 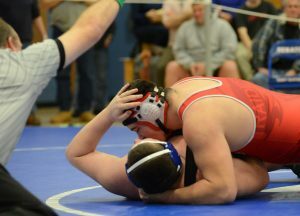 Section 3 champ Hunter Shaut was a state champion last year and is having a great year this year. His only 2 losses were close decisions to D1 wrestlers at the Eastern States Classic. He defeated S3 wildcard Philpotts 2-1 in ot to win the title this year; Philpotts finished 3rd in NYS last year and will definitely contend for a title. S11 champ Jack Bokina finished 2nd in the state at 126 last year but has handled the jump to 145 quite well! 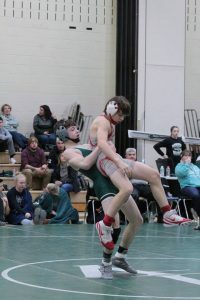 He is 42-2 thsi season with his two losses coming at ESC to D1 studs Shanahan and Mosher – ironically they are the same two wrestlers who have defeated Shaut this year. Cory Day from S6 is having a great year and we should also keep an eye on S9’s Ian Houck who is poised to make a run at the medal stand. This weight is deep too – we should expect to see Duers (S2) and Wood (S5) contend for spots on the medal stand! This class is loaded with four returning state placewinners and several others who not only have a shot at placing, but could actually take home the title! S1 champ Jack Chesman finished 3rd in NYS last season and is 31-3 this year. Two of his losses, however, are to wrestlers in this bracket – Petretti from S11 and Carroll from S3 (by forfeit). Chesman’s opponent in last year’s medal round match was Dylan Ingrao from S6 who needed a wildcard this year because he lost in the S6 finals to Zach Brown! Section 2 champion Zach Lawrence finished 5th in NYS last year and is 47-2 this year! His two losses were down at 145 at the ESC where he lost to Gissendanner and Bokina. PSAL champ Bogie finished 6th in NYS last year and will definitely contend here. Both S3 entries, Williams and Carroll, could place high here as could both S5 entries, Compton and Sharp. Where to start, where to start??? Jacob Nolan is a multi-time NYS placewinner and he finished 4th last year. He also took 4th at the ESC this year. 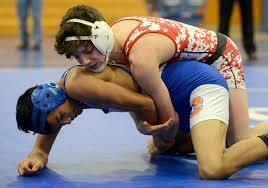 Dan Torres placed 5th at the state tournament last year and his having a great year. He is 54-1 on the season and his one loss was avenged in the S6 finals to wildcard entry Rowe. Cooper (S2) and Roes (S3) both are having great seasons and could place high here as can S11 champ O’Neil. DeRidder from S8, Palaszewski (S2), Johnson (S4), and S9 champ Schaifo will all be in the hunt as well! Great weight at 160 D2! Section 3 champ Ross McFarland was a state finalist last season and is definitely one of the favorites to take the title this year! 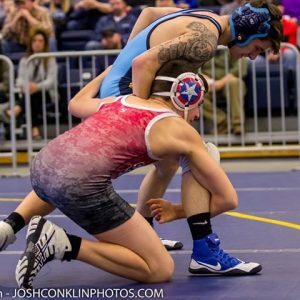 He has not lost to a D2 wrestler all season however one of his toughest wins was a 3-2 victory over S9 champ Dillon Ross who is also one of the favorites here. Section 6 champ Penhollow has an impressive 54-1 record and will be in the hunt here as will S2 champ Conte as will S5 champ Wolfanger. Don’t sleep on Rifanburg from S4 or O’Brein from S8…both are very tough. There is plenty of talent in D2 at 182 but S7 champ LaPier, S4 Champ Slater, and S3 champ Fredericks are probably the top 3 dogs! Lapier placed 3rd in NYS last year and finished 5th in the ESC this year after dropping a close 5-3 decision to eventual champ Jake Logan in the semis! Fredericks placed 5th at the state tournament last year and Slater took 8th at the ESC this year. Mike Sabella from S11 is very tough and we also should keep an Hoose from S6. Butler from S9, Damboise from S5, and McNeil from S2 will also contend for a spot on the podium here. Section 3 champ Simmons was a state finalist last season and finished 5th at this year’s ESC making him the favorite at 195 D2 but he will not run through this weight class untested! Section 6 champion Corey Keefe placed 6th at last year’s state tournament and lost a 1-0 nail-biter to Simmons earlier this year. Keefe defeated Zach Trim in his Section 6 final but Trim defeated Keefe earlier in the season so he’s certainly in the conversation as is Section 4 champ Richie Knapp who is putting together a solid season! S5 champ Holley is 33-3 and could go deep here as could the S5 wildcard Degroff who has a win over Holley this year. A few other to watch include Spoon from S2, Croston from S11, and Floyd from S4. Section 3 champion Joe Benedict is a 2X NYS finalist and he plans on ascending up the podium to that top spot this year! 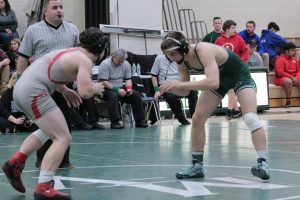 Benedict is undefeated and had pinned nearly every opponent in the first period including in the finals of this year’s Eastern States Classic. He has scored bonus points in all but 2 matches this year. Benedict’s stiffest competition will likely come from S6 champion Rigerman who’s only loss on the mat this season was a 5-1 loss to D1 stud Andreesen. A few others to watch in this bracket include Section 5 champ Barnhart and Section 4 champ Rice. This is a very open weight class but PSAL champ Gomez and S6 champ Robinson seem to be the favorites. Robinson placed 4th at ESC and posted a 4-3 win over Wood in the tournament. Gomez only has 1 loss and that was to D1 stud Rabinovich. Both Section 4 entries, Williams and Wood, could place high here as could S3 champ Briggs. Section 9 champ Liam Dietrich is only a sophomore but has been showing great improvement. He could definitely surprise some people here. Thanks for your honesty…I just edited the post…I am very confident you’ll get him next time Ian!! !